My Secret Santa package arrived and it was good. I opened the box and discovered three items wrapped in newspaper (reuse! ), with instructions on the order in which to unwrap. Strangely, it was easier to plug into a USB port than a real one. Gift #1 was a USB stick. Wait. 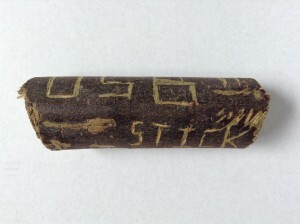 It was a stick from a tree with “USB stick” scratched into the bark. WTF, worst Christmas ever!!!! I cried for several hours, before mustering up the physical and emotional strength to open the next gift. 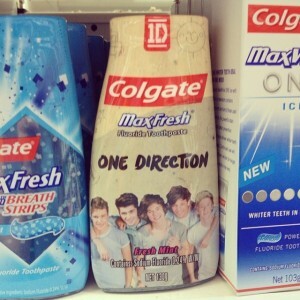 One Direction would actually be improved if they replaced Louis with a sheet of lined refill. 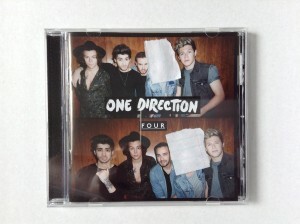 Gift #2 was a CD of Four, the fourth album by One Direction. Despite having previously moaned about One Direction gifts, I was actually really happy to receive Four. While I do enjoy the musical oeuvre of 1D, I’m not enough of a fan to actually buy their albums, but Four is a good pop recording and represents a new stage in the boy band’s evolution. And besides, “Steal My Girl” is really decent tune. My Secret Santa also went to the effort of blanking out all appearances of Louis in the CD booklet after I expressed my dislike of him. This was a really kind and thoughtful, because if I’d seen L. Tomlinson’s likeness, Christmas would have been ruined again. The perfect accessory for the modern girl. 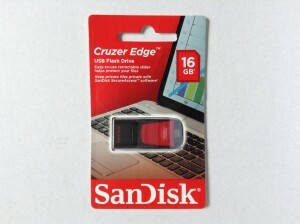 Gift #3 was an actual real USB stick, a nice 16GB thing that I can use to put thing on. Hooray! Christmas is saved! My Secret Santa also included a letter that old his amazing story (so far), and in a way that was the best part of package. On the flip side, my Secret Santa recipients enjoyed the present I got for them. It was hard because they were a business, but in the end I think I got something that a group could enjoy. By the way, NZ Post and Secret Santa fans have donated more than $6000 to the Christchurch City Mission. The mission also gets all the gifts intended for people who didn’t keep up their end of the bargain and send a gift. So everyone has a happy Christmas! It’s Secret Santa season, and I’ve again taken the plunge and signed up for NZ Post’s very well organised NZ Twitter Secret Santa. 1. No one wants One Direction merch. Not even actual One Direction fans (especially not 1D fans). What the merch represents is not why people like One Direction. It’s not a keyring with their faces on it; it’s their music and their #cheekybantz. And, curiously enough, those things can be legitimately enjoyed for free online. 2. Novelty gifts are a heartbreaking waste of resources. George Monbiot wrote a piece about the short, pointless lives of novelty gifts and their impact on the planet. It made me think of all the weird novelty gifts I’ve received over the years. They all eventually end up in the bin or are taken to the local recycling shop. There’s a bit of science that says that people enjoy experiences more than objects. I keep seeing tweets from ladies saying “Something nice from Lush would be ok” and I think, yeah, some nice bath stuff would be really enjoyable. It doesn’t have to be complicated. When I come to buying a Secret Santa gift for my person, I just think “Is this something I would like to receive?” If the answer is hellz yah, then that’s the thing. Get out of my mouth, Louis.